My biggest issue with Fitbit (NYSE:FIT) is its lack of consistency. Simply put, the fitness tracker’s shares and its business fluctuates too much for my liking. I don’t mind a volatile investment when the underlying business is robust, but that’s not the case with Fitbit stock. FIT is a troubling name because there are definitely positives here. It makes you want to consider owning it, but when there’s a name like Apple (NASDAQ:AAPL) lurking around, pulling the trigger is tough. For instance, Apple has quickly become the number one market share player in the smartwatch category, even with its premium-priced products. That gives an opportunity for discount players like Fitbit. But at the same time, those discount players exist in the smartphone market too, and we don’t want them. We want the ones that are profitable, and to be frank, there aren’t many of them. The biggest pro that stands out to me is the balance sheet. As of last quarter, Fitbit stock is carrying approximately $474 million in cash and around $249.5 million in short-term investments. This sum — roughly $723 million — makes up 50% of the stock’s market cap while Fitbit carries zero debt. From a financial perspective, that’s a very attractive situation. We’re basically getting the entire business for about $750 million. For a company that does $1.5 billion-plus in annual sales, some will certainly find that attractive. This is a valid argument particularly if Fitbit can stay cash flow positive and erase its annual net loss. Alas, those are some of the negatives too. Despite having no debt and a huge market share opportunity in the low- to mid-range smartwatch market, Fitbit stock just can’t find consistent bottom-line momentum. Nor can it find cash-flow consistency. We’ll look at the charts in a minute, but let’s first go over the estimates. Analysts currently expect revenue to grow 2.9% this year to $1.56 billion, and another 2.9% next year. The growth is consistent, but it’s not really that impressive. On the earnings front, estimates call for 15% growth in 2019 and 53% growth in 2020, both of which are impressive off those low revenue-growth estimates. The flip side is that analysts expect losses both this year (17 cents per share) and next year (8 cents per share). Over the last 12 months, the company sports free cash flow of $60 million. However, management said it expects free cash flow of -$40 million to -$70 million in fiscal 2019. Fitbit execs are trying to implement a turnaround here and we can see the rays of hope. If done correctly, FIT stock could be a huge winner. Keep in mind, doubling the stock prices gets us to “just” $11.50, so there’s definitely potential here. However, investors have to realize that Fitbit is a speculative investment. As a result, I personally prefer a company with a less-lumpy trajectory and better-performing stock. Speaking of the stock, let’s look at a long-term weekly chart of Fitbit stock. 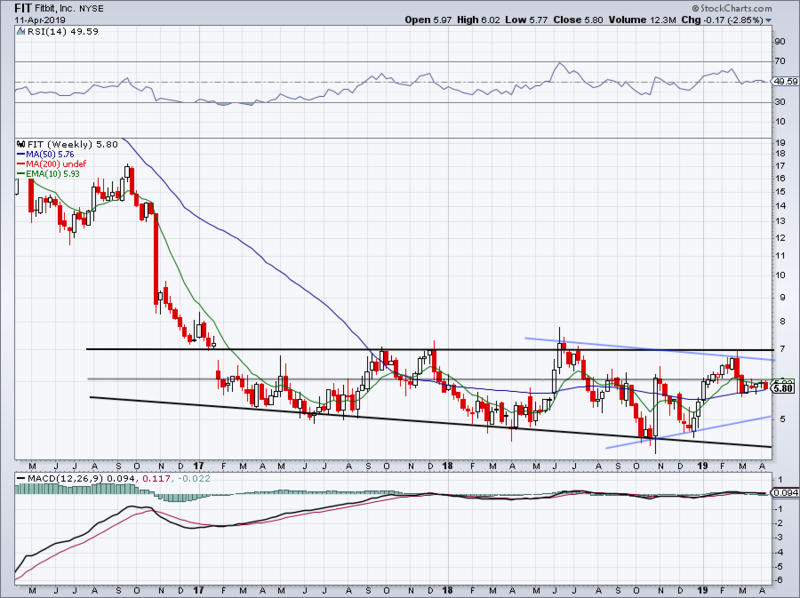 It’s clear that resistance is up at $7, while support is in a downtrend but present near $4.50. Both are shown in black lines, while the blue lines highlight a series of higher lows and lower highs. In other words, Fitbit stock is tightening, a coiling pattern that’s been in place for almost a year now. On an even smaller time frame, investors can see that FIT stock is being supported by the 50-week moving average with resistance at $6, and to a degree, the 20-day moving average. Even on the short-term chart below, this coiling action is taking place. If shares can hurdle $6 and the 50-day moving average at $6.12, they could fill the gap north of $6.75. 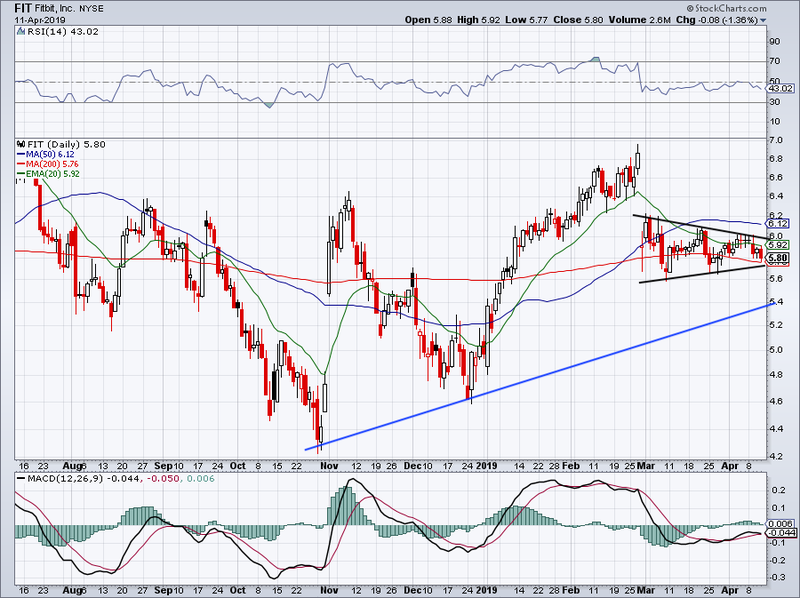 Below uptrend support and the March lows, and FIT stock may decline to $5.40 before finding any meaningful support. So which way will Fitbit stock break? It’s impossible to say, honestly. If management delivers, it will likely give the stock the momentum that it needs to push higher. If they fail to deliver, lower is likely. Bret Kenwell is the manager and author of Future Blue Chips and is on Twitter @BretKenwell. As of this writing, Bret Kenwell is long AAPL. 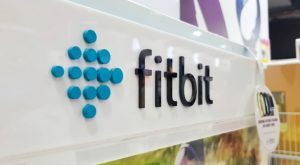 Article printed from InvestorPlace Media, https://investorplace.com/2019/04/fitbit-stock-just-isnt-worth-buying-with-apple-in-town/.